Elect Hand Fans Design Elect Hand FansCustom Lanyards with high shine finish that makes them stand out from crowd, a great product for promotional events. Your degin or logo will stand out good due to its shiny finish. 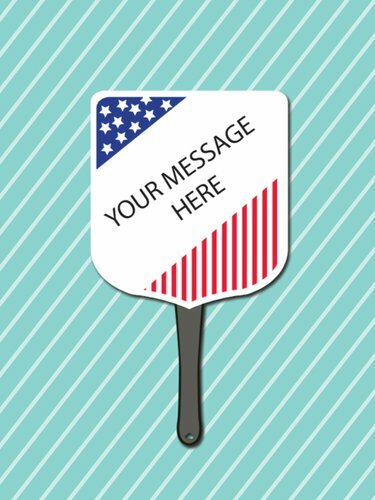 Our Elect Hand Fans can come in handy during the election season and can be personalized to giveaway as a great keepsake for your supporters. During the political campaigns, they can add a cool breeze and be a popular promotional piece for your rally participants in the hot weather. Their unique design, sturdy construction with thick 16 point card stock board, and digital printing make them highly fashionable promotional items. They are reasonably priced to be embellished with your message, graphics, and sponsor logos to keep them memorable for your audience. In a bright summer day, they can generate cool breeze for your assemblage!